Cardington quarterback Nate Hickman turns up field against Northmor’s defense Friday night. The freshman hit on 7-of-14 passes for 64 yards with one TD. IBERIA — Northmor overcame a close first half with KMAC and county rival Cardington before pulling away for a 46-20 homecoming win Friday night. The Golden Knights move to 6-0, 3-0 and prepare for a trip to undefeated East Knox this week. “We knew they were tough. They’ve played tough first halves against everybody this season,” Northmor head coach Scott Armrose said of Cardington (0-6, 0-3). The Knights put up 479 yards of offense and took over in the third quarter after holding a 28-20 halftime lead. The Knights entered the game ranked fourth in Division VI, Region 23. The top eight teams in each region qualify for the playoffs. “That’s good for us; we needed to be tested a little bit and our boys responded and did a good job,” Armrose said. Tailback Conor Becker paved the way with 256 rushing yards on 25 carries and scored four touchdowns. He has 1,040 yards on the ground this season. Quarterback Hunter Mariotti, a junior, threw for 146 yards on 8-of-11 pass attempts. He added 47 yards on 7 carries. Gavin Ramos,a 5-7, 140-pound junior, was on the receiving end of 4 Mariotti passes for 50 yards. Senior Cole Dille caught 2 touchdown passes, from 13 and 18 yards out. “Hunter does a nice job of spreading the ball around,” Armrose said. 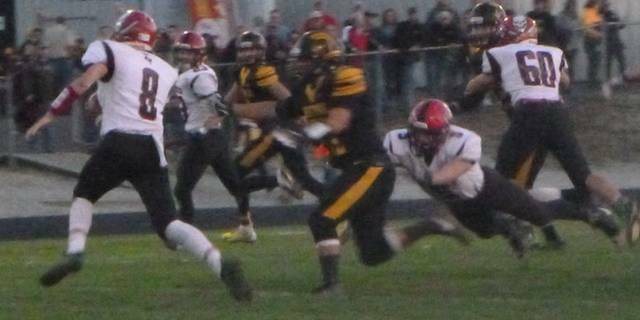 Cardington was led by Mason Goers with 106 yards on the ground on 25 carries. He has 760 yards this season. Becker’s 54-yard run started the scoring for the hosts. He added scoring runs of 1 and 63 yards later in the quarter and tacked on a 28-yarder in the third quarter. The game had some sloppy moments with Cardington committing 4 turnovers and Northmor 2. Pirates quarterback Nate Hickman hit on 7-of-14 passes for 64 yards with one TD and three picks. Trey Brininger caught a 12-yard scoring pass from Hickman, who also ran for a TD. Armrose said the league is a physical one. The trip to Howard to take on the unbeaten Bulldogs awaits. East Knox beat Centerburg 42-7 to stay undefeated.